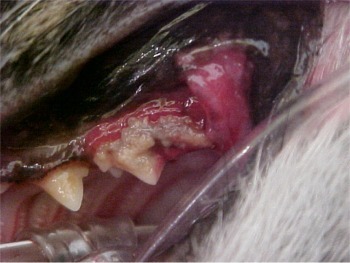 Prevention and treatment of periodontal disease, abscessed teeth and cavities keeps pets comfortable. These problems all cause pain in animals just as they do in people. 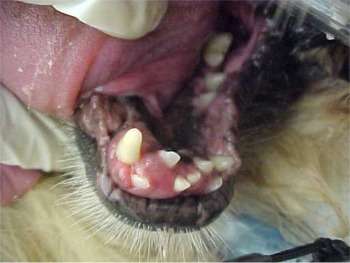 Pets also can suffer from oral tumors, malpositioned teeth and other diseases of the mouth. This little cutie is Violet. 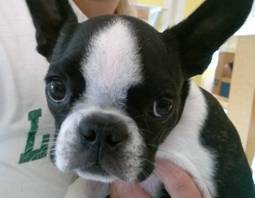 She is a 7 month old Boston terrier. 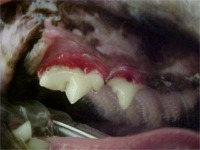 Many of her adult teeth did not come in all the way and her lower canine teeth didn’t erupt at all. When we spayed Violet at 6 months of age all her adult teeth should have been in already but the lower adult canines were nowhere to be seen, and her baby canine teeth were still present when they should have fallen out. 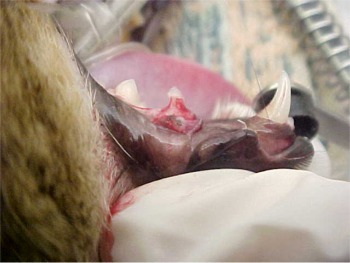 Dr. Boss attempted to remove the baby canines, to get them out of the way so the adult teeth could erupt properly. 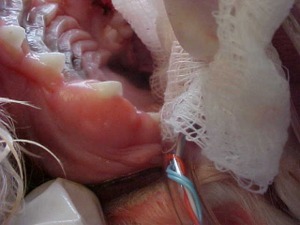 She was unable to remove the roots of those baby teeth entirely and fluid came out when she attempted it. There should never be fluid in the jaw or around the teeth. 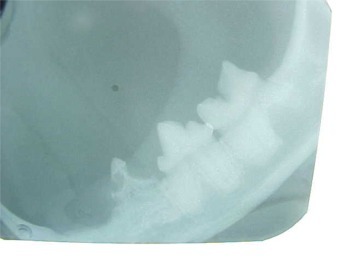 An x-ray revealed that the adult canine teeth were stuck within the jaw and pointing the wrong way. 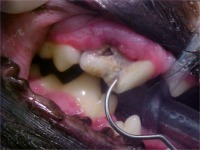 We consulted with our local veterinary dental specialist, Dr. Dale Kressin, about what to do. He told us that the cystic fluid building up, where the malpositioned teeth should be, would eat away at the jawbone and destroy it, so those retained teeth needed to be removed. A normal lower jaw is shown on the left, with the canine teeth and the incisors at the proper angle. 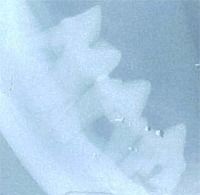 On the right is Violet’s x-ray with the large canine teeth sitting inside the jawbone and pointing toward the incisor teeth. Those incisors are being pushed out of position. The black areas on each side are the cysts where there was fluid build-up. A few weeks later, Violet went under anesthesia again at the dentist’s office and more x-rays were taken. The lower incisor teeth needed to be extracted because of bone destruction from the cysts. The first three lower premolar teeth on each side were removed in order to get to the malpositioned canine teeth so those could be removed as well. Altogether, Violet lost 14 teeth, 7 on each side, plus the root remains from the baby canines that were fused into the bone. All this was expensive as well as sad for the dog, though she is recovering well from her dental surgery. Violet’s dental problems were inherited and she also was born with a cleft palate, another genetic abnormality. Chances are good she has relatives who also have dental abnormalities. Many breeds of both dogs and cats have genetic diseases related to the teeth and the mouth, so dental health is a key thing to research before you purchase a puppy or kitten. 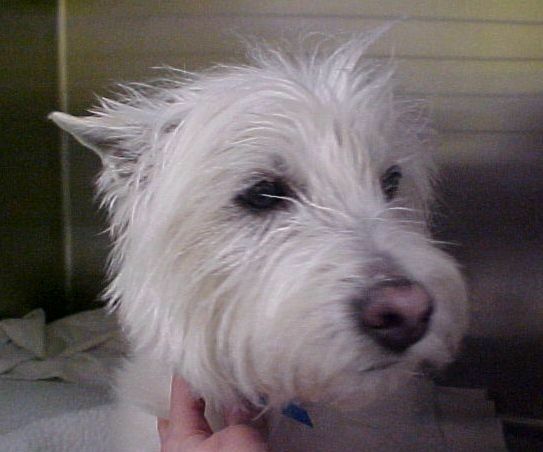 This is Weilly, who is a 9 year old West Highland white terrier (Weilly the Westie!) He came in to Best Friends for a dental cleaning. Once we cleaned the plaque and tartar from the teeth we could see three problems. He had a 4th upper premolar tooth that was discolored, which signified that at least one root of this three rooted tooth was dead, leaving the tooth without its normal blood supply. 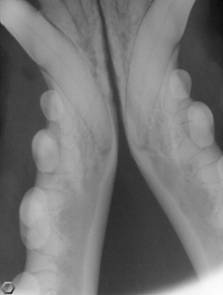 In addition, both his lower 1st molars had holes in them on the tongue sides of the teeth (where they couldn’t be seen without anesthesia). X-rays of these three teeth revealed holes in the enamel and dentin of the teeth. We call these cavities “resorptive lesions” because the tooth structure is being reabsorbed back into the body, leaving a gaping hole and exposed pulp and nerve tissue. Ouch! 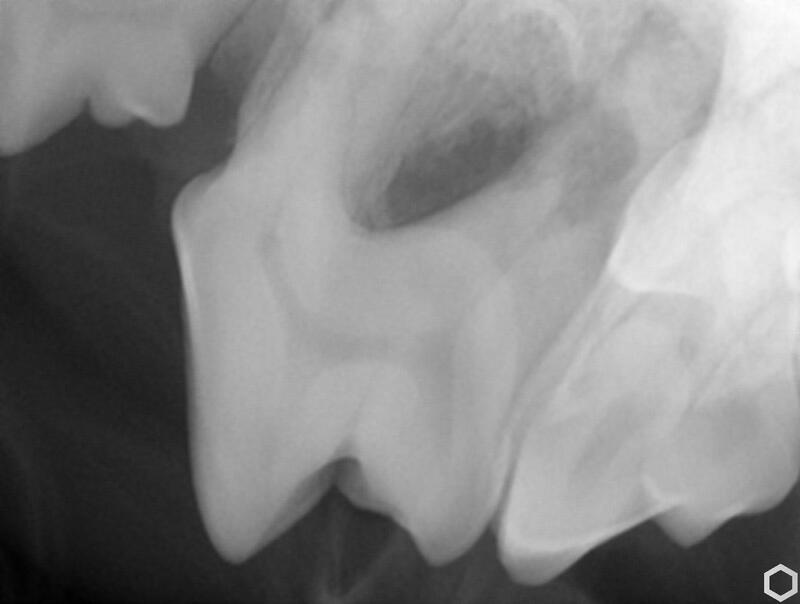 The large, irregularly shaped hole in the upper 4th premolar had almost eaten entirely through the bone between the two roots and one of the roots as well. 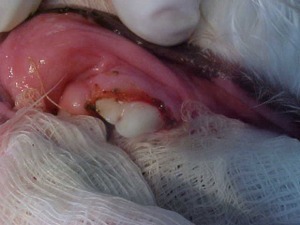 Weilly’s owners were faced with the choice between extracting all three teeth, for a goodly sum of money, or extracting just the upper tooth and having root canals and fillings for the lower molars by a dental specialist, for an even greater sum of money – several thousand dollars. These are three of the four largest chewing teeth in the dog’s mouth, so saving two of them would be desirable, owner’s financing permitting. 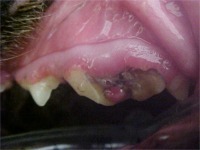 Unfortunately for both the pet and the pet owner, Weilly is likely to develop more resorptive lesions in the future, as the cause is unknown and there is no preventative treatment that would safeguard the rest of his teeth. Which option would you choose if this were your pet? Below are some pictures of common problems we see. 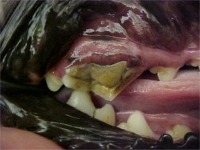 This puppy’s teeth did not erupt normally through the gums and the teeth are covered with excess gum tissue. We used a CO2 laser to remove the excess gum tissue so she could eat and chew normally. 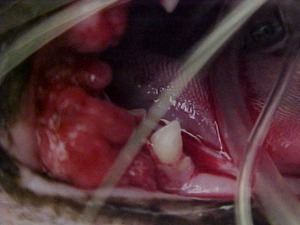 This cat has a cavity, called a Feline Oral Resorptive Lesion or FORL. It has eaten away the crown of the tooth. 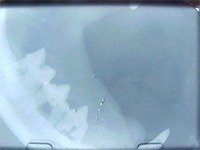 The dental x-ray shows the same tooth. 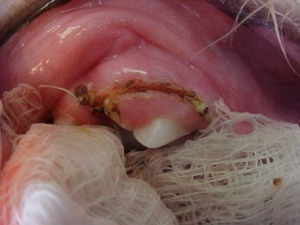 These lesions are very painful, and affected teeth should be removed. 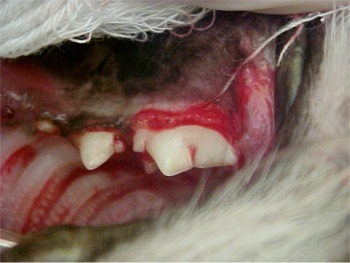 About 40% of cats develop one or more of these cavities, usually between the ages of 2 and 10 years. If one cavity develops there is a 75% chance that additional teeth will also develop them. Here is another FORL, this one in a canine tooth. Ouch! 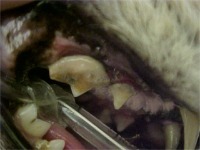 This dog has a tumor growing between the incisor teeth and pushing them out of position. Periodontal disease occurs when infection works its way under the gums and along the tooth roots. First the gums get red and sore, then the gum and bone start to recede, exposing more and more of the tooth roots. Eventually there will be so little attachment of the root to the bone that the tooth will fall out. 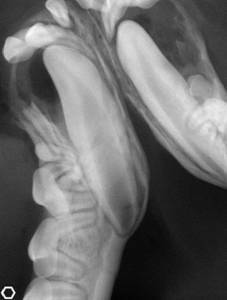 These x-rays show receded bone in the jaw of a cat and a dog. 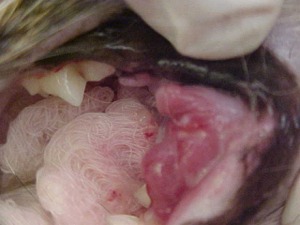 The before and after dental cleaning views of a cat show what usually causes the periodontal disease (heavy tartar), and the partially exposed tooth roots after the teeth are cleaned. Notice how red and sore the gums look. 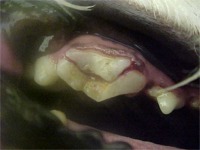 This pet has a tooth with a large cavity (to the left) and a larger back molar (to the right) with periodontal disease. The root toward the left is no longer attached to the bone at all – this tooth is soon to fall out. Stomatitis means inflammation in the mouth. This is usually a problem of cats. It is thought that affected cats have developed an allergy to the plaque bacteria in their mouths. The allergic reaction causes the gums and mouth tissues to become red, swollen and sore. Many times there are also cavities and periodontal disease involved. 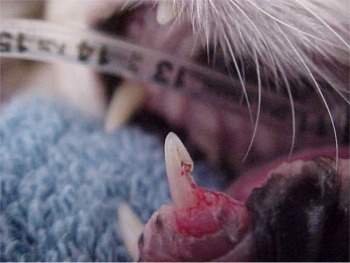 Infection with the Feline Leukemia or Feline Immunodeficiency viruses can lead to gingivitis or stomatitis. The most successful treatment is to remove the teeth where the inflammation exists, although we may try antibiotics and anti-inflammatory medications first. When a large piece of a tooth breaks off it’s called a slab fracture. 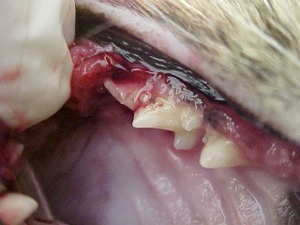 This type of broken tooth usually occurs when a dog bites down on something harder than the tooth. Just as when flaking a piece of rock to form an arrowhead, biting down at just the right spot breaks the tooth. If the piece is shallow and the root is not exposed the tooth will be rough and accumulate tartar more quickly than a healthy tooth. If the pulp of the tooth is exposed, either because the broken piece is large or decay sets in where a smaller piece broke off, the tooth will become infected and painful. Extraction of the tooth or a root canal will restore a healthy and comfortable mouth.